I haven’t posted a card in a while, and I found this while going through my old photos. It’s a card I made for my mother-in-law’s birthday back in May and forgot to post. I didn’t take in-process photos again (I’m always in such a hurry when I make cards) but this is really simple to make if you have the right materials. This card illustrates why it can be really helpful to buy coordinating materials. If you go to the craft store, you’ll find lots of matching papers & embellishments. I’ve never really been one to buy those things together, but after making this card, I will. This paper was part of a gift my grandma gave me last Christmas. It’s by Creative Memories and is part of a larger set. I started out with a plain white card, then layered a plain black piece of paper underneath a slightly smaller white paper with a black pattern. I tried a few different papers before finding the combination I liked best. Using a paper cutter with a ruler attached is really helpful for this. I measured the card, then cut the black piece of paper 1/2 an inch smaller each direction so there would be 1/4 inch border. Then I cut the white patterned paper 1/2 an inch smaller than the black paper in each direction for the same 1/4 inch border all around. 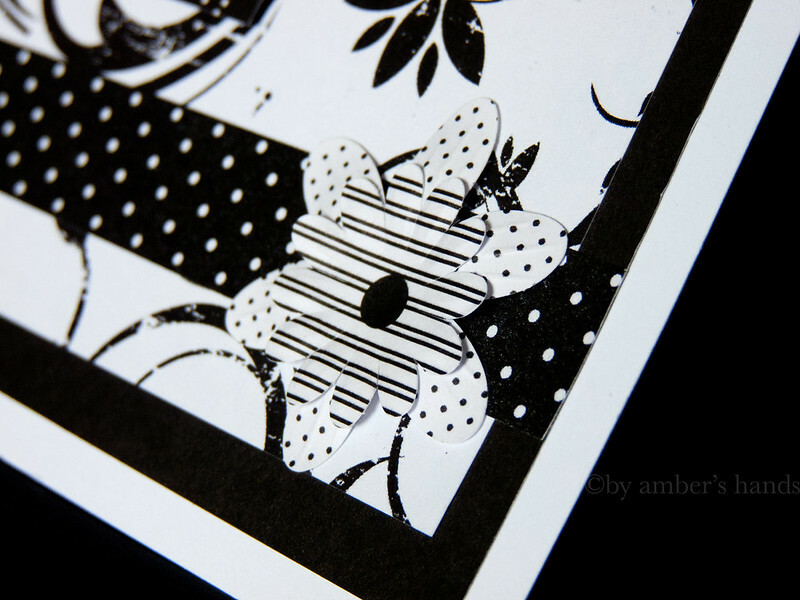 The black paper with white polka dots is actually paper ribbon, but could easily be duplicated by cutting a strip of regular paper to your desired dimensions. 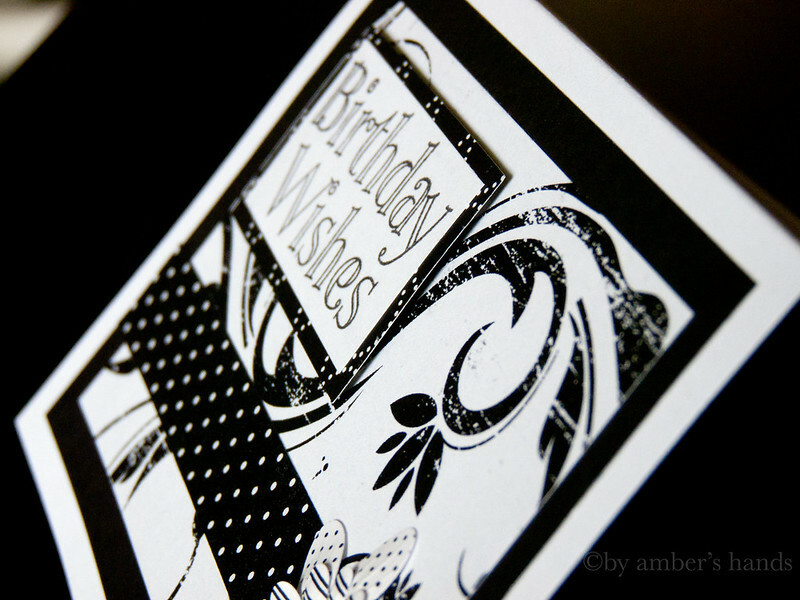 I made the ribbon go over both the white patterned paper and the black, but stopped before reaching the card. 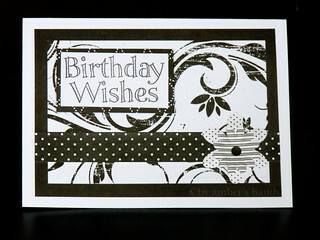 For the birthday greeting, I took a “Happy Birthday” stamp and stamped it on plain white paper. Then I mounted it to a piece of black patterned paper with a glue stick. Then I mounted that on the card with foam glue dots so it was raised from the surface of the card. The flower is actually 2 flowers from the same set the papers came from. I layered them on top of one another and glued them together. Then I glued them over the ribbon. That’s it! It’s pretty simple. After making this card, I found a small set of paper and some floral embellishments at my local craft store on clearance. So I got a pad of paper and a 6 or 8 piece package of flowers for a couple bucks apiece. You can get plain white or ivory cards in a pack of 25 for about $10. So if I only make 6 cards from that matching set of paper/embellishments (I’ll likely make more than that) each card will run just over $1 to make. That’s way cheaper than the $5 cards I find at Target. 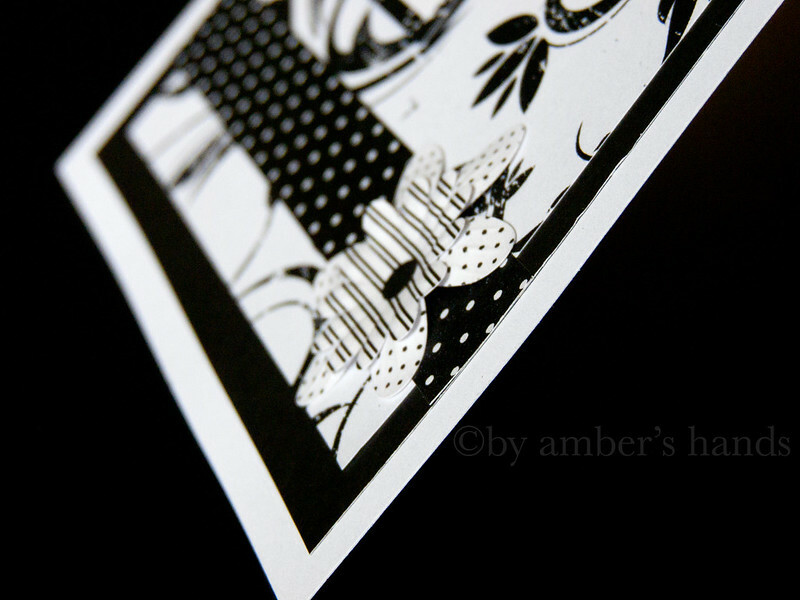 Even if you’re a novice, cards like this are incredibly easy to make, but look as good as the ones you buy. I hope you give it a try!